Eurocom is offering a full-service GPU upgrade program for customers who want to have a supported graphics card installed in their laptop by a professional upgrade technician. Eurocom customers can have their laptop graphics card upgraded by a Eurocom upgrade professional. Eurocom is happy to announce this service with arranged shipping from the North American customer’s location to our facility, where a professional technician does the work. The technician removes the previous graphics card and installs the new graphics card, which includes re-applying thermal paste and thermal pads, re-installing the heatsink, and testing the card with a variety of benchmark software to ensure proper installation. When we’re done, we ship the laptop directly back to your chosen North American location. When purchasing an upgrade kit, customers can now add the Installation Service. Shipping is arranged for your laptop to be transported to the Eurocom upgrade center. Once the upgrade has been completed, the laptop is conveniently shipped back to the customer’s chosen location. To see if your laptop supports upgrade, please visit the Eurocom Upgrade Center. Eurocom offers a complete line of fully configurable laptops, Mobile Workstations, and Mobile Servers; from GPU to storage, from RAM to Processor, nearly everything can be configured to the application and performance requirements of the individual user. The gained experience with upgrades has given Eurocom technicians expertise in upgrading a variety of systems. Eurocom offers a complete line of fully upgradable MXM 3.0b graphics modules, allowing customers to upgrade to newer graphics technology, improve video performance, and extend their laptop's lifespan. “GPU-upgradeability is one of Eurocom’s core design values since our inception in 1986. It allows users to extend the lifespan of their cherished laptop by improving GPU generations. We offer both full GPU upgrade service as well as self-upgrade, allowing some users to develop new skills and upgrade their GPUs to new performance heights,” says Mark Bialic, Eurocom President. “Don’t waste your time upgrading, let us do it for you! Our technicians have amassed a vast wealth of expertise upgrading a variety of laptops. So if you are feeling unsure of upgrading your laptop, simply let our experts help you with this full-service upgrade,” says Mark Bialic, Eurocom President. Customers can take advantage of this opportunity by either ordering an upgrade kit from the Eurocom website or choosing the Full Service Upgrade. The upgrade kit consists of the desired Graphics Card, IC Diamond 7 Thermal Paste, Thermal Pads, X bracket with matching screws, heat-sinks (when applicable) and SLI or CrossFireX cables (when applicable). The Full Service Upgrade option consists of a Eurocom Upgrade Expert personally upgrading the North American customer’s system and providing a tune up, including shipping both ways, not including the cost of the graphics card. Eurocom is offering upgrade solutions for phased out laptop models to allow consumers and companies alike to extend the lifespan of their systems while benefitting from enhanced performance and usage of new software that requires new graphics technology. Eurocom and several other laptop developers integrate MXM 3.0b technology into their high-performance laptops and gaming laptops because it allows those systems to support the most powerful graphics technology on the market while allowing for possible upgrade options. Laptops that incorporate MXM 3.0b can be easily upgraded with newer or higher performing cards of the same standard. This allows users who have purchased an upgradeable system to improve the performance and increase the lifespan of their system with an easy upgrade. 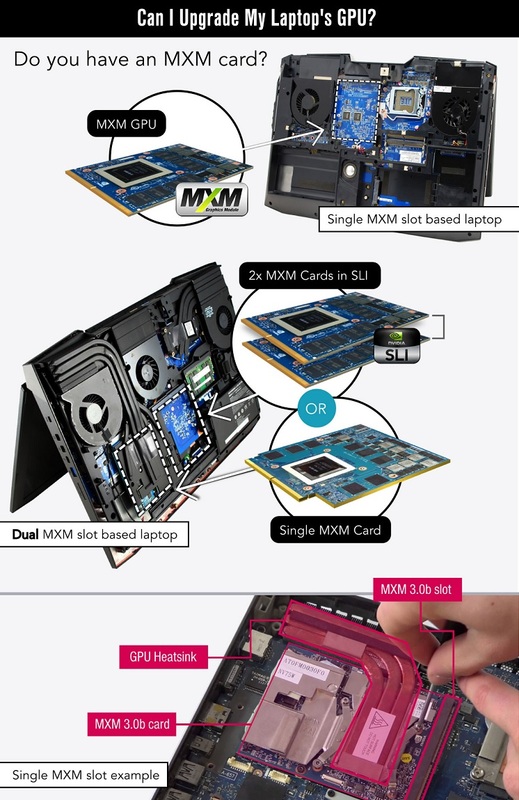 Modular MXM graphics solutions are ideal for high-performance desktop replacement laptops and mobile workstations, embedded systems, SFF (Small Form Factor) PC, and CUDA developers that require high-performance GPUs.